Dany Chaloub is a emerging writer and a video personality. After working in the design industry for many years designing cars to handbags. He decided to pursue his passion for video games by designing one on his own. From overseeing day to day business and product development at Jack Georges to assisting with interviewing and writing about some of the video game industry most recognizable figures. Dany brings his varied experience in the video game world to GamerHub.TV. In addition to being available for Xbox 360, Xbox One, PlayStation3, PlayStation 4, Nintendo’s Wiiand Wii U and the Nintendo 3DS, “Skylanders Trap Team” also ushers in the complete console gaming experience on tablets through a Starter Pack that supports iPad, Kindle Fire and Android tablets. Paul Reiche, president of Toys for Bob and one of the inventors of “Skylanders,” talks about the new game in this exclusive interview. What are some of the new characters for this game? We’re really excited about Skylanders Minis. These are tiny little Skylanders. They’re the cutest guys we’ve ever brought out and they were special editions in very rare quantities early on. People wrote back to us and asked if they could be fully playable Skylanders, so this year we have the eight Skylanders Minis that we’ve brought out over the past three years and then we’ve added eight new ones. They’re fully upgradable. They’re fully playable, and they are really cute. What’s some of the gameplay that they bring to the table? They have full upgrade trees. Really, it’s all about the personality of these guys. When they jump, they’re really tiny little characters and so they jump really high and they run really fast. They have tons of energy, and also you buy them in two packs so they’re $13.99 for two characters, which is quite a discount over the $9.99 figures. What will tablet gamers get from this new game offering? What’s really cool about the tablet game this year is it is exactly the same game as the console. We’ve delivered the full console Skylanders experience. We not only had to bring the full game across, but we actually had to create an entire environment around the tablet. So that includes a cool new Bluetooth wireless portal, but then inside the portal is a full controller that’s got dual sticks, face buttons, shoulder buttons, and it feels great in the hand. It’s a little bit smaller for our players who have little bit smaller hands. It’s wireless and is also Bluetooth. Both the portal and the controller work across the tablets for iOS, Android and Amazon Fire OS. Can you save the characters progression across platforms and tablets? Right now all of our consoles, including the tablet, keep the game saved separately. But I think what players really care about is the development of their Skylanders and we always save that inside the toy itself. You can carry that between game sessions and across different platforms. You can carry 175 Skylanders from the previous games and they all work on the tablet and on any of the consoles. What are your thoughts about how far technology has come with these mobile devices that you can bring a console game to them? It’s changing so fast. 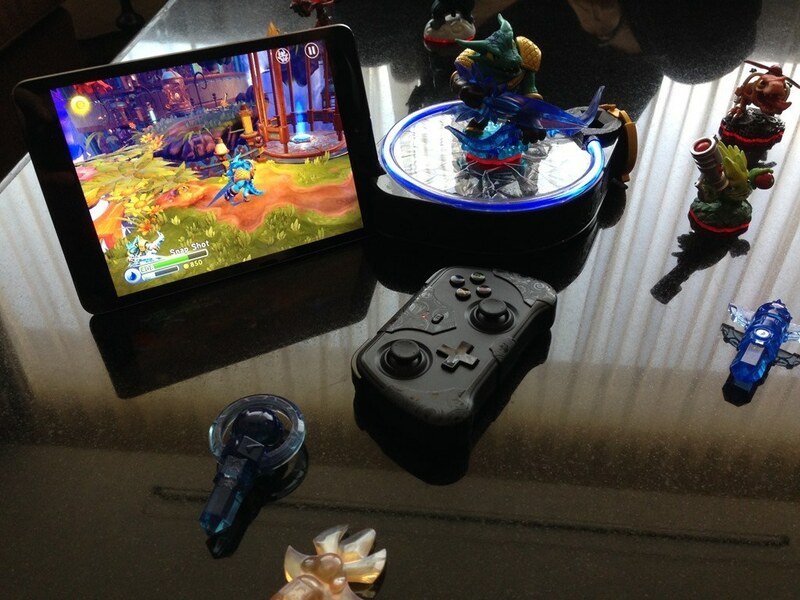 We’ve wanted to do a tablet version of Skylanders for a while, but it wasn’t until the last year that the power of the tablets and their graphic abilities really started to rival that of modern consoles. So boy in two or three years, who knows what they’ll have. We’re also starting to see tablets connect to the big screen TV and this seems like a perfect game for something like that. Sure with an HDMI cable you can connect something like an iPad to the big screen and the range on the Bluetooth is sufficient that you can actually sit down and play it in your living room.